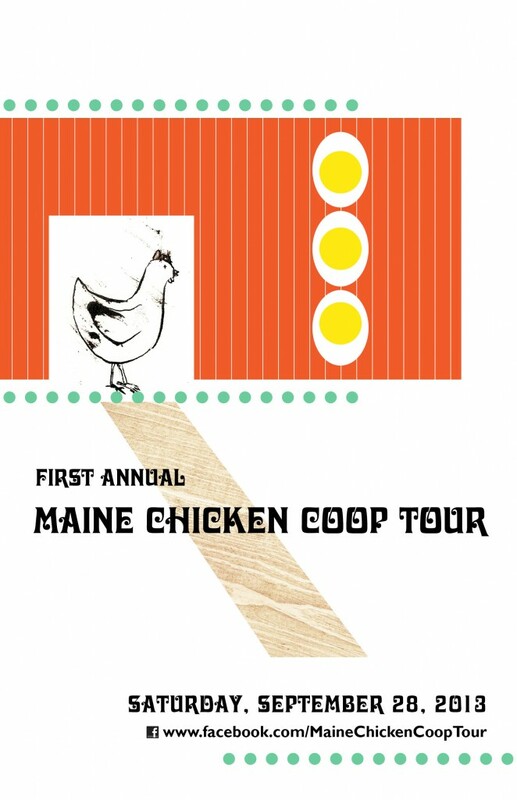 The First Annual Maine Chicken Coop Tour will be held Saturday, September 28, 2013 from 10AM – 4PM. This self-guided tour will showcase an array of backyard chicken coops that display a variety of construction designs and materials, from recycled to custom designed coops. Inspired by the Funky Chicken Coop Tour in Austin, Texas, the organizers of the tour hope to bring together chicken enthusiasts while encouraging education, community, and local food. The tour is for anyone planning to start their own backyard flock, and/or curious about why keeping backyard chickens is so popular. It is free to attend and open to the public. What tour goers will see: Different styles of coops including an old farmhouse coop that has been customized, several coops made from unassembled and assembled kits created by the Maine company Roots, Coops & More, and coops created from plans found on the Internet or in a book. Some coops are stand alones, some are built into a barn or other farm structure. Ask owners about using reclaimed or recycled materials, brooding chicks, protecting a flock from weather extremes, choosing a breed, predation prevention, and even composting coop litter. Along with chickens, tour goers will have the opportunity to see honeybees, gardens, sheep, goats, and donkeys. Due to insurance reasons, homeowners are unable to let participants use their bathrooms or enter their homes. Tour goers should plan accordingly and leave pets at home. Additionally, for bio-security purposes tour goers are asked to refrain from handling birds or touching structures, bedding or equipment during their visit. A list of the locations will be posted on the tour’s Facebook page and here. The organizers hope to get copies of the list of tour locations to local feed stores (e.g. Paris Farmers Union in Bridgton…) – if that is done those stores will also be posted here and on the Facebook page.